Supertow II HTE Featuring the Original Patented Aircraft Lazy Susan. Self loading by rolling up and under nose gear raising and locking carriage in place. To unload just pull the release handle and back out allowing the plane to roll smoothly off the machine. Moves most aircraft weighing up to 9600 lbs. Applications include King Air-90, Socata TBM-700, Pilatus PC-7, Cessna Conquest, Piper Aztec, Beech Duke. AFTER COMPLETING YOUR ORDER, WE WILL CONTACT YOU WITH YOUR TRUCK SHIPPING ON THIS ITEM BEFORE WE SHIP. Smooth, power-packed machine with the feather touch clutch load and go system. Push-button electric start and headlight included. 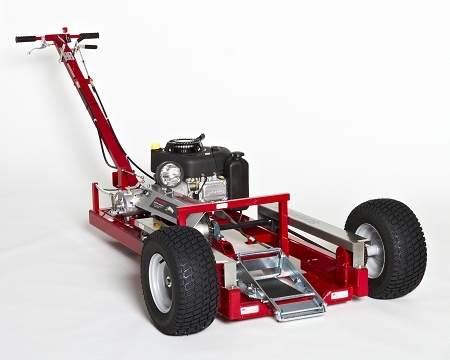 The Same robust design and features of the Supertow III & IV, the Supertow II is a maneuverable, compact machine. Ideal for larger singles (Without Wheel Pants), tail draggers and medium twins such as Beech Duke, KingAir-90, Socata TBM-700, Cessna Conquest I, De Havilland Otter, Platus PC-7, Aero Star, Grumman AgCat, Piper Meridian, etc. Runs on 100LL or Auto fuel. The Supertow II HTE comes with a more robust 10.5HP engine for larger aircraft such as the Cessna 400 series and TBM 850. For Aircraft with wheel pants see the single wheel Powertow line. When ordering, please complete the entire order. We will check for your best shipping rate and give you a call prior to finalization of sale.